BT Sport Box Office action will return with a bang in 2019 after bringing some of the finest pay-per-view boxing world title fights to BT TV, Sky and Virgin customers over the past eight months. BT Sport Box Office HD launched in September 2018 with the thrilling middleweight world title rematch between Saul 'Canelo' Alvarez and Gennady 'GGG' Golovkin before finishing the year with two of the most dramatic battles in recent boxing history. On December 1, Tyson Fury was unlucky to be denied the win against WBC heavyweight champion Deontay Wilder despite surviving a brutal knockdown in the 12th round. The Gypsy King produced a career-best performance on only his third fight back since returning from a lengthy hiatus but Wilder retained his belt after the fight was controversially scored a draw. Three weeks later, Josh Warrington defended his IBF featherweight world title against Carl Frampton in a pulsating back-and-forth affair at the Manchester Arena, triumphing on the scorecards after a fight crowned by many as the finest of the past 12 months. Our first pay-per-view event of 2019 sees former unified light-welterweight champion Amir Khan in action against one of the most formidable names in world boxing - WBO welterweight king Terence Crawford. The Nebraska fighter is widely considered to be among the top three pound-for-pound boxers on the planet – but in 2004 Olympic silver medallist Khan, “Bud” faces a man more than capable of causing an upset on his quest to become a two-weight world champion. 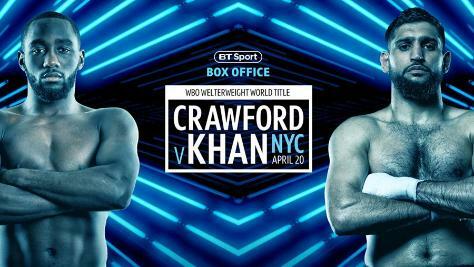 Pricing information and further details of how you can order Terence Crawford v Amir Khan will be released shortly. Visit www.bt.com/sport/box-office/ for more information. Amir Khan has never been one to shirk a challenge, as one look at his resume will tell you. The beloved Bolton fighter famously jumped two weight divisions to challenge Canelo Alvarez for the middleweight crown in 2016 and has previously shared the ring with some monsters of the light-welterweight division. Paulie Malignaggi, Marcos Maidana, Zab Judah, Lamont Peterson and Danny Garcia are just a few of the standout names from his 37-fight career – but his next opponent will surely provide Khan’s toughest test yet. On April 20, the 32-year-old fulfils every fighters’ dream, stepping out at the iconic Madison Square Garden in New York to take on pound-for-pound great Terence Crawford for the WBO welterweight title. Not for the first time, Khan will enter the ring as a huge underdog but he will need no further motivation than the prospect of securing what would be the finest win by a British boxer on foreign soil in recent memory. The undefeated Crawford is a former undisputed champion of the light-welterweight division, and one of only five boxers to have simultaneously held every major world title in the four-belt era. His 34-0 record boasts 25 knockouts – including back-to-back kayos since stepping up to 147lb, stopping Jeff Horn and Jose Benavidez Jr in the ninth and 12th round respectively. The Nebraska native is a slick, switch-hitter blessed with exceptional speed and sits behind only Vasiliy Lomachenko in The Ring’s pound-for-pound rankings. However in Amir Khan, Crawford will face arguably one of the only men in the division able to match his speed. And as he demonstrated with a blistering 41-second knockout against Phil Lo Greco last year, he remains a clinical finisher when he feels his opponent is hurt. Can Khan pull off one of boxing’s greatest shocks? BT Sport Box Office HD is the only place to find out on April 20. • BT TV, BT Sport on Sky or Sky customers who have previously watched BT Sport Box Office can pay using their remote control. • Sky customers new to BT Sport Box Office can register and pay online at www.bt.com/sportboxoffice. • Virgin TV customers should visit the On Demand section and choose Live Events. • Customers in the Republic of Ireland can purchase BT Sport Box Office with Eir Sport. • Anyone who wishes to watch the fight online should visit www.bt.com/sportboxoffice and follow instructions to subscribe and watch on the web or on the BT Sport Box Office app, and customers can watch on the big screen using Google Chromecast and Apple Airplay. BT Sport Box Office HD launched with a trio of world title fights in 2018 featuring some of the biggest names from the world of boxing. Relive highlights of all the action below. Josh Warrington proved the naysayers wrong once again as he defeated Carl Frampton in emphatic style during a bruising 12-round war at the Manchester Arena to retain his IBF featherweight title. Two giants of the heavyweight division brought the sporting world to a standstill after producing a memorable spectacle at the Staples Center in Los Angeles that ended in a controversial draw. Mexican middleweight Canelo Alvarez edged Gennady Golovkin in a majority decision to take home the spoils after another barnstorming showdown between the two arch-rivals following their controversial draw in 2017. Looking for the finest action the sporting world has to offer? From UEFA Champions League and Premier League football, rugby, boxing and lots more, BT Sport is bursting with epic matches.